Each week his voice is heard on a variety of programs and commercials via more than 2,000 radio and TV outlets worldwide. 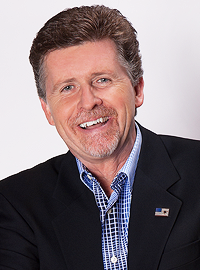 Mark's Southern California talk show airs on AM760 KFMB weekdays 10AM to Noon. He often appears on Fox News Channel and serves as a news analyst and commentator on KUSI Television (Channel 9) in San Diego. Known for traveling the world to gain insight on important stories, he's covered the Iraq war on location in the Middle East, smuggled Bibles to the underground church in Southeast Asia and done ground-breaking broadcasts from war zones including the Persian Gulf region and Afghanistan. Mark's also visited Russia and made several trips to China, including Tibet. His continuing on-site broadcasts in the USA and around the globe give him a unique perspective on current events. With the San Diego Radio Broadcasters Association, Mark served as President for a record eight consecutive terms. Radio & Records twice named him to its "All-Star Players" list, citing him as one of only twelve "local legends" in American talk radio. A strong advocate for the United States military, Mark is a lifetime member of the Navy League, a member of the San Diego Military Advisory Council and has Honorary Plankowner status with the USS Ronald Reagan, commemorating his on-going support of the ship and its crew since commissioning in 2003. He is also a member of the Reagan Ranch Board of Governors. From 2009 until May 2017 Mark was heard mornings on AM 1170 KCBQ as well as special programs on sister station AM1210 KPRZ. Prior to moving to the Broadcast Company of the Americas in August 2007 (through 2008) Mark was heard on his popular daily show on Clear Channel's KOGO. Before joining KOGO in 2004, he was a well-known radio talk show personality on Salem Communications' KCBQ/KPRZ San Diego and KRLA 870AM, Los Angeles. He was also the main guest-host for SRN network's Michael Medved, Dennis Prager and Hugh Hewitt shows. Mark joined KPRZ as General Manager in 1994, after eighteen years with KFMB (CBS) Radio in San Diego, where he was Program and Operations Manager and a popular afternoon personality. He also served as National Program Director/Radio for KFMB's parent company. Active in a variety of charitable organizations, Mark is a member of the Board of Directors for the San Diego Air & Space Museum, now serving in his sixth term as Chairman. He has also been part of on the Global Leadership Council and Board of Directors for Heart to Heart International. Mark's also been chairman of Media Fellowship International, San Diego Prison Fellowship international and is a founding board member and current chairman of the Family Heritage Foundation. He was also a charter member of the Salem Communications Political Action Committee. As a board member for Enough Is Enough®, he also serves as spokesman for www.protectkids.com. His voice is heard regularly on the " Turning Point" radio and television broadcast, with more than 2,000 weekly airings worldwide. He's also featured on Purity Products' Health Line radio and TV programs. Mark is listed in Who's Who In America and Who's Who in the Media and Communications.